Different 3D printing processes include: stereolithography (SLA), selective laser sintering (SLS), binder jetting, poly-jet, fused deposition modelling(FDM)/fused filament fabrication (FFF) and more. Depending on the type of material being used, the pressures involved to obtain sufficient and consistent material flow can be an issue. This is especially true for plastics. To understand the problems, researchers have tried to model the impact of different pressures in 3D printers. In his master of science thesis, “Applying feedback control to improve 3D printing quality,” the author relates the error between an analytical solution and a computational-fluid-dynamics (CFD) solution to the steady-state non-Newtonian pipe flow problem (the fluid does not conform to Newton’s Law of Viscosity) for various pressures. See Table below. To improve the printing process, one company has already introduced a pressure-controlled 3D printer. The SLA Elemental printer utilizes a laser system to cure photosensitive resins, but unlike other SLA printers it uses a pressure control system to control resin levels when an 3D object is being built. One of the benefits of pressure control in a 3D printer is a reduced need for print support structures where there is overhang in a 3D model. The pressure control allows the material surrounding the cured material to hold the build material in place long enough for the laser to cure the resin above it. If you are a coffee connoisseur, getting the right brew is essential. Besides fresh ground beans of a specific type, for many people an essential element in the brewing process is pressure. In fact, by definition, espresso is brewed by passing high pressure water through the coffee. 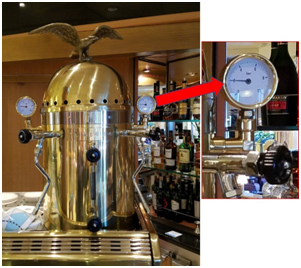 According to guidelines from the Istituto Nazionale Espresso Italiano, the entry water pressure is 9 ± 1 bar (130.5 ± 14.5 psi) , the entry water temperature is 88 ± 2°C and the coffee is brewed for 25 ± 2.5 s.
With these specific criteria, it is not surprising that coffee making machines were developed to ensure that the precise process is followed consistently. A commonly used coffee machine for commercial applications can easily cost thousands of dollars and it is not unusual for the machine to have a pressure indicating gage on it. This LaCimbali coffee machine indicates 2 bar (29 psi), the incoming line pressure, with a maximum possible reading of 10 bar (145 psi). Another brewing technique involving pressure is the Moka pot. This stove top or electric device uses steam pressure to push water through coffee grinds. Unlike an espresso machine, the pressure in a Moka pot is only about 1 bar (14.5 psi) and is assured by steam pressure, so no measurement would be involved. The Keurig coffee machine automates a pressurized hot water process and precise quantity of coffee in pods to deliver a consistent brew to the user. The pressure is fixed and lower than an espresso machine but the user can select the amount of water to satisfy their taste buds. These machines are typically priced under $100 so there is no pressure indication to the consumer. However, the nozzle/needle can become clogged and then the machine shuts down and displays a ‘Water Under Pressure’ warning. Also, to ensure proper functioning at higher altitudes of 5,000 feet and above, some Keurig machines have a user selectable high altitude mode.